Facebook has unveiled new features to the site, which are designed to make the tagging of photos easier. Speaking about the new face-recognition tech in a blog, Sam Odio from Facebook says about the updates: "People love tagging their friends and family in photos, but we've heard that it can be a tedious process. "You now can add tags with just a couple of clicks directly from your home page and other sections of the site, using the same face detection technology that cameras have used for years." 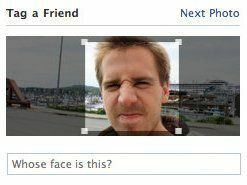 Essentially this means that you don't have to manually add an image box to faces to tag them, as Facebook will now automatically 'see' the faces. Those who are worries that they are automatically going to get tagged smoking and boozing at the work's party, don't be, it will recognise your face as an, er, face but you still have to manually add a name to the mug. Odio knows a lot about this sort of tech as until a few months ago he was part of Divvyshot – a photo-sharing service which was snapped up by Facebook. The company was bought to make Facebook's photo service better, so the addition of better tagging should be the first in a long line of tweaks.